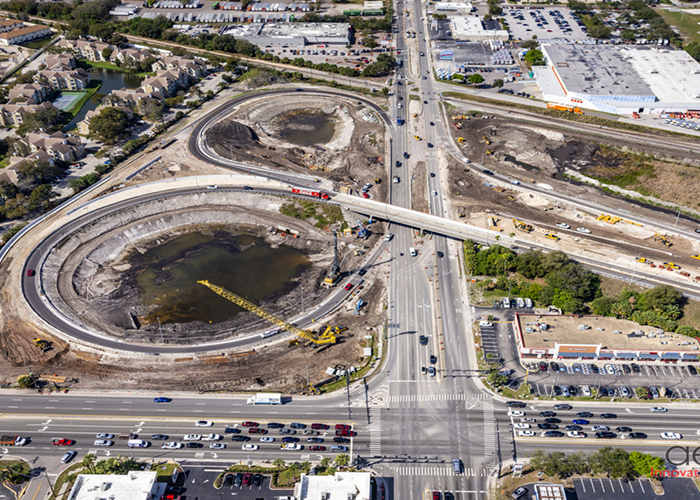 The Selmon Extension construction is moving along on schedule, with expected completion of the massive project in 2020. When finished, the Selmon Extension will offer toll-paying commuters a traffic-light-free drive from the Brandon-end of the Selmon Expressway across the Gandy Bridge and into Pinellas County, where overpasses now under construction will link to Interstate 275. The 1.9-mile elevated toll road will have one lane in each direction and run from the Selmon’s current endpoint at the Gandy Boulevard and South Dale Mabry Highway interchange to the Gandy Bridge. The Tampa-Hillsborough Expressway Authority (THEA) says separating regional commuter and business traffic from the local traffic below will ease congestion by taking vehicles off Gandy Boulevard, reduce the wait time at traffic lights and cut down on the number of crashes from red-light running and distracted driving. The $230 million project started in early 2018 with the widening of West Gandy Boulevard. Construction of the elevated roadway started in February of this year. With construction picking up steam, a line of concrete support columns is forming down the median of Gandy Boulevard and construction crews have started to put the road deck in place. On the east end of the project, crews have removed an old overpass bridge over Gandy Boulevard and started work on new traffic ramps. In total, the extension will be made up of 744 separate pre-cast roadway sections, each weighing 72 tons. The wait time at traffic lights at four major intersections is projected to decline significantly -- from 49 percent at Dale Mabry up to 65 percent at Lois Avenue. The extension will also give residents, including those moving into the developing Westshore Marina District on the Tampa side of the Gandy Bridge, another hurricane evacuation route. The elevated toll road will be 30 feet high, taller than most similar roadways, to give drivers traveling below along Gandy Boulevard a good view of businesses on both sides of the road. Designers also reduced the number of support columns by 30 percent and spaced the columns out, on average, by 200 feet to give businesses’ better visibility. In the midst of the massive construction project, motorists on Gandy Boulevard are now encountering traffic delays and occasional lane closures. THEA has held four online virtual town halls so far to provide updates and get public feedback. The latest was in February. Graves says the next will likely be in the Fall. During the virtual town hall meeting in February, public concerns included the loss of customers for businesses, the elimination of some turn lanes at West Shore Boulevard, longer commute times and the temporary closure of Al Palonis Park until the project’s completion. During construction, the Authority has regular meetings to update business owners on the project and hear their concerns. THEA has also promoted a Shop Gandy! campaign launched in partnership with the South Tampa, Greater Tampa, St. Petersburg Area, and Greater Brandon chambers of commerce to promote businesses along the roadway during and after construction.